NOW WE CAN CATCH 'EM TOO...PERHAPS! THE NAME, The Carp Catchers’ Club was a proud boast, because sixty years ago carp were considered to be virtually uncatchable in the UK. However, the club’s members thought otherwise. The club’s most notable achievement was probably Richard Walker’s capture of a record-breaking 44lb common carp from Redmire Pool in Herefordshire, on September 13th, 1952. It was always a most exclusive club; and yet it would be an error to assume that membership was automatically open to the most successful carp fishers in the land. The letters of The Carp Catchers’ Club, edited by member Maurice Ingham and published by The Medlar Press in 1998, show that great emphasis was placed on sportsmanship, but also on any prospective member being “the right sort”. This class-conscious aspect of the club may jar with modern sensibilities; but a certain level of education and erudition was required of members: simply because it was a duty of membership to add to, and circulate, an informative rotary letter. Thus Walker was to write of the highly accomplished carp catcher, Robert Atkinson, who had captured a string of large fish from North Stoneham Lake in 1952: “Atkinson, with whom I have corresponded, caught his fish on floating crust. Atkinson was never offered membership of the Carp Catchers’ Club, even though by 1959 he had landed far more twenty pound fish than Walker himself. All members of the club were supposed to have caught at least one carp weighing ten pounds or more: but this requirement was waived for one member, the popular John Norman: mainly because he had been present when the club was first formed, on the banks of Mapperley Reservoir in 1951. Other, conflicting accounts say the club was formed at Woldale. No matter - for a year, the pressure was really on Norman to justify his place; and in July 1952 he succeeded at his home water of Mapperley, with a 18lb 8oz mirror carp. But it is fair to say that, despite the constant encouragement of Walker, Norman never felt particularly comfortable in the club. But Norman was not alone when it came to modest catch rates. By modern standards few members of the club would be considered highly successful carp anglers. For instance, in 1952, Walker himself only managed to land three carp weighing over 10lbs, although one of these was the forty four pounder. Prominent member Bernard Venables also caught three, to nineteen pounds, as did Maurice Ingham, to twenty four pounds and twelve ounces. However, it should be noted that few waters held big carp in those days, and the carp that Walker and his team fished for were truly “wild” fish: not conditioned to take an angler’s bait; not dependent on anglers’ free offerings for survival. This is in stark contrast to the modern scene where, typically, made-made pools are grossly overstocked with hungry carp whose fate it is to eat anglers’ baits and free offerings, or die of starvation. There is no doubt that Walker’s accounts concerning the cunning of carp were no exaggeration. But the past is another country, and no more so than here. What then, were the true achievements of the Carp Catchers’ Club? Club members pioneered night, early morning and evening sessions for carp; and Walker in particular was instrumental in designing special tackle for carp angling: in particular the famous Mark IV carp rod, the electronic bite alarm and a giant landing net for those out-sized specimens. The club was lucky in its choice of waters: soon gaining access to the legendary Redmire Pool, which was then, by far and away, the most promising and mysterious carp pond in the land; the home of leviathans. But the club was not so fortunate in that Walker, having caught his British record carp on bread, seemed to close his ears to further developments: most notably concerning baits. In 1955, club member Maurice Ingham, writing in the rotary letter, was years ahead of his time when he suggested that small baits, so-called “particle baits”, could be one way to fool the increasingly tricky Redmire carp. He wrote: “As I see it, we are faced with two alternatives. Either we must try to imitate the natural food of the carp in our hook-bait or we must overcome this small-particle preoccupation. But according to capture lists in Kevin Clifford’s great book, Redmire Pool, between 1951 and 1963 - the era of the Carp Catcher’s Club, only 13 carp over twenty pounds in weight were caught fairly from the lake by club members and friends. On this total, twelve were caught on bread in various forms, and one on a humble worm. When particle baits were used at Redmire, in the 1970s, the results were truly eye-opening. In 1975, for instance, Clifford used various particle baits at Redmire, both as hook-baits and free-offerings - presented on a massive scale - and he managed to catch an unprecedented 18 twenty pound carp from the pool in just four months. Small baits used by Clifford included sweetcorn and red dari seeds. So the evidence is clear that the early success of the Carp Catchers’ Club led to dogma, most notably in the area of baits, and this eventually limited the potential of the club. The club’s exclusive nature also limited it, because it was not necessarily open to the anglers with the best ideas and the greatest abilities, only to carp fishers who were considered “the right sort”. 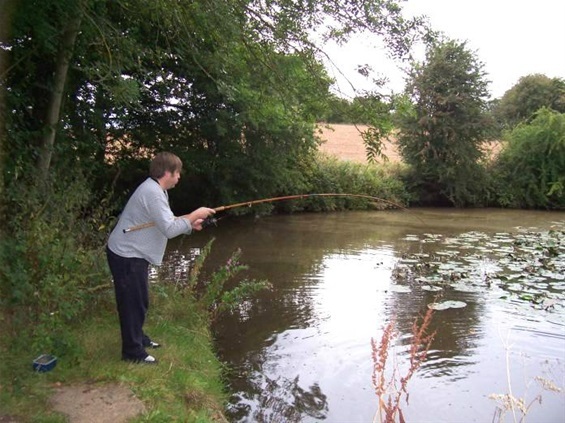 However, the formation of the club laid the foundations of modern carp fishing, because its members, most notably Richard Walker, Maurice Ingham, Bernard Venables and Peter Thomas, demonstrated that large carp could indeed be caught. PICTURE ABOVE - No, not a member of the CCC in action, but the Gnome making rather hard work of a hard-fighting carp! I call such exertion "carp puffing", given the expanding expression on my face!